The fan is the component that has rotating blades which provides air circulation. A ceiling fan is a machine which converts electrical energy into mechanical energy, suspended from the ceiling of the room and uses its rotating paddles for the flow of air. It gives fresh air during the summer season when rotates anticlockwise and provides hot air during winter when it rotates clockwise. These are one of the viable components that must be present in a room. It improves the control of climate as well as increases energy efficiency. It also consumes less power. Some conditions must be taken care of while choosing top ceiling fans in the summer. It is commonly known that the size of a ceiling fan is directly proportional to the size of the room. If it is a small room, then we need a small fan, and if it is a large room, then we need a large fan. Because at the end we are concerned about economy and comfort. So, choosing a ceiling fan according to a size of the room is best as it provides enormous comfort and also it reduces our electric bills as it consumes less energy than our air conditioner. Another care which must be taken care of is that the height of the ceiling fan concerning the floor. It should not be at a very high height or should not be lowly hung. It should be approximately hung at the height of seven feet from the floor. It should not be lowly hung because in case of normal activities of a person while stretching or raising hand there is a possibility that hands would strike the blades of the fan and potentially cause injuries to the person. And if it is hung at a larger height then it is possible that the air circulation would not reach to the person present in that room. The easiest method to measure the size is by counting some blades present in the fan. If an odd number of blades are present then the measurement is taken from the center of the fan to one of the blade and multiplied by two. If the fan has an even number of blades then the measurement is done by considering one corner of a blade to the opposite corner. There are different online sites from where the correct measurement of a fan according to the room is given and as per that we can check the size of the fan. It is the phenomenon caused when there is an imbalance due to different weights of the fan blades. The fan blades are made up of same material and strength but still, it can differ in weight after some time because of rusting or dirt present on the blades, screw becoming loose or blade irons getting bent. So, this factor must also be included while choosing a ceiling fan. 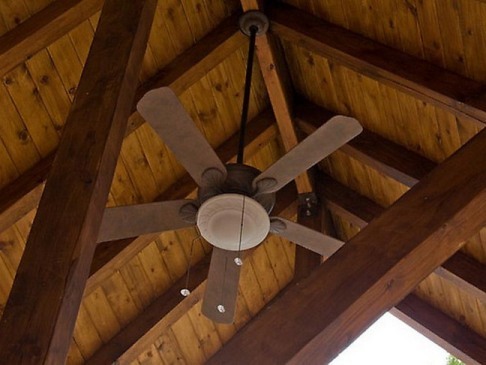 These were some of the few factors that must be taken care of while choosing a ceiling fan. Proper instructions and care must be taken to ensure adequate maintenance.